Dorm Co. Tip: Dorm rugs are cute dorm supplies! When dorm room shopping, don't forget about rugs for dorm rooms! Your college dorm room does not have dorm room carpet. That means you will be stepping on cold dorm linoleum every time you wake up in the morning. You don't want to do that! 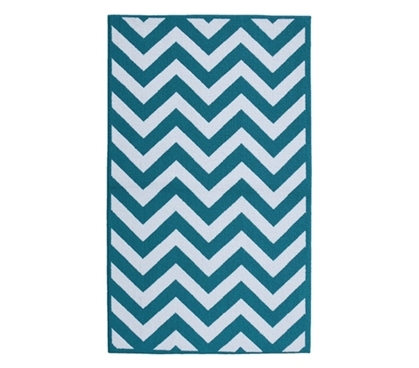 With our Chevron College Rug in Teal and White, you don't have to worry about getting harshly woken up with cold dorm linoleum under your feet. Put a pair of your comfy dorm snoozies on your dorm rug next to your bed, and you don't have to worry about stepping on cold linoleum at all in the morning! The simple Chevron design in teal and white will be great for your dorm room decor, as well! The simple design won't take away too much from your dorm bedding or other dorm room decor, but rather add to it. Teal is a great color that goes with anything, so you know you're making a great choice with teal and white! In size 5' x 7', this college rug won't look too oversized and out of place in your dorm room but it will be large enough to provide comfort and style to a bland dorm room.